Everyone in the UK knows who ‘Boris’ is. 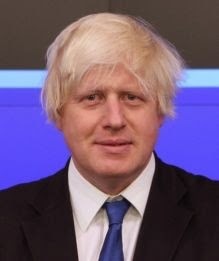 He is the Mayor of London and is seen by many as the leader-in-waiting of the Conservative Party. Not so much because of his abilities (which are considerable), but because of his charisma. He has Sun conjunct Venus in Gemini. He has charm and the gift of the gab, and he clowns his way through problems that would be the end of many politicians. In an electoral contest, the person with the charisma always seems to win. 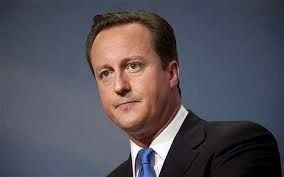 Even if you only have a little bit, like David Cameron, that was enough to beat the dour Gordon Brown. Of course, there were other reasons that Labour lost, like the minor matter of being at the helm when the economy had its biggest crash since the 1930s. But with a bit more charisma from Cameron, the Tories would probably have won outright, instead of needing to form a coalition. Unexciting leaders don’t tend to get re-elected, whereas exciting ones do. They don’t need clear policies, just the ability to wow the crowd, which Boris Johnson has in spades. This seems to be how Democracy, the ‘advanced’ political system that the West tries to foist on the rest of the world, works. But astrologically, his moment is passing. Leaders who get elected tend to do so under major transits, and they remain in power until those transits have passed. Thatcher had Pluto to see her through her time in power, Blair had Neptune. 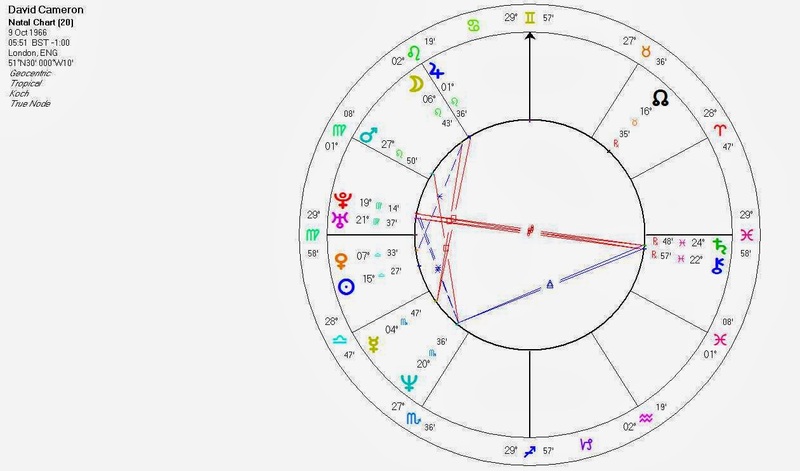 For the last few years, as his political star has risen, Boris Johnson has had Pluto and Uranus hard aspecting his Angles. In 18 months Pluto will start to pull away from opposing his MC, and I think that will be that. 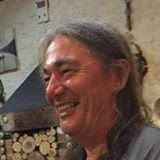 Between now and then, he will remain very popular, and he may get elected as an MP in next year’s General Election, on a tide of hope that he will replace Cameron as leader. But that will be his high point. His Progressed MC has recently moved from Leo into Virgo, and as it gathers momentum, he will find himself in a position of service rather than leading. David Cameron has Sun at 15 Libra, which Pluto is starting to square, but Pluto won’t start to properly move away until 2017. So he is likely to remain leader of the party at least until then. That will be Boris’ moment. 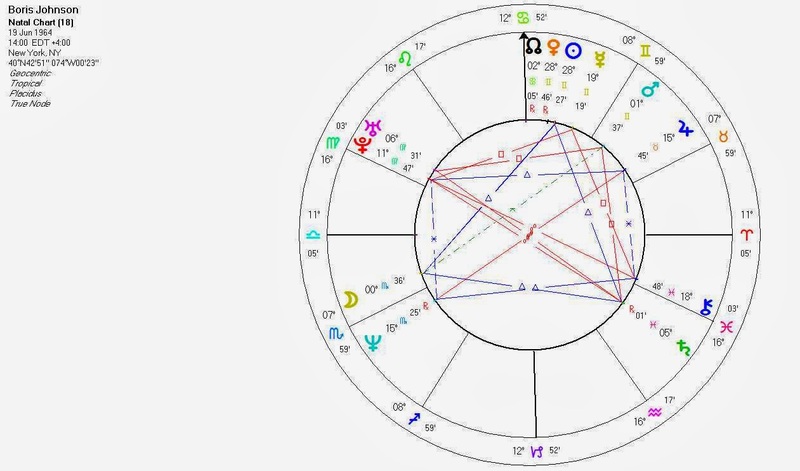 But not only will Boris lack the major transits to carry him into power, Uranus will be starting to oppose his Scorpio Moon, and that suggests to me the real reason why he won’t become leader: something unpalatable will come out about Boris. It may even be something he has done already, that an enemy is keeping in reserve. Boris already has a history of being less than straightforward. He lost his first job as a journalist for making up a story. He was taped agreeing to reveal the address of a journalist to a friend who wanted to beat up the journalist, though he never did reveal the address. He denied an affair to his party leader that was bound to come out, he had a child from another affair whose existence was kept secret by court order for many years. What will Boris do next? It may be that nothing comes out, but nevertheless there is still the sense you can’t quite rely on Boris to stay away from scandal, and when push comes to shove and the Tories are asked to elevate him from crowd-pleaser to leader, they may shy away. Whichever way, he doesn’t seem likely to become leader.